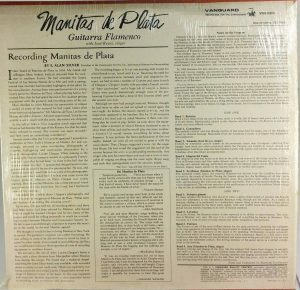 There’s a bone of contention re: Manitas de Plata with the connoisseurs of flamenco music. To them, this is not authentic flamenco, it doesn’t have the right “beat”, or compás (see the section about compás in the Wikipedia article on Flamenco – link will open a new tab). That may be so: not being a specialist or even connoisseur of flamenco, I won’t challenge that. But I’d rather look at it from another angle: whether this is “authentic” flamenco or not, who cares. Picasso, Dali thought it good enough for them. 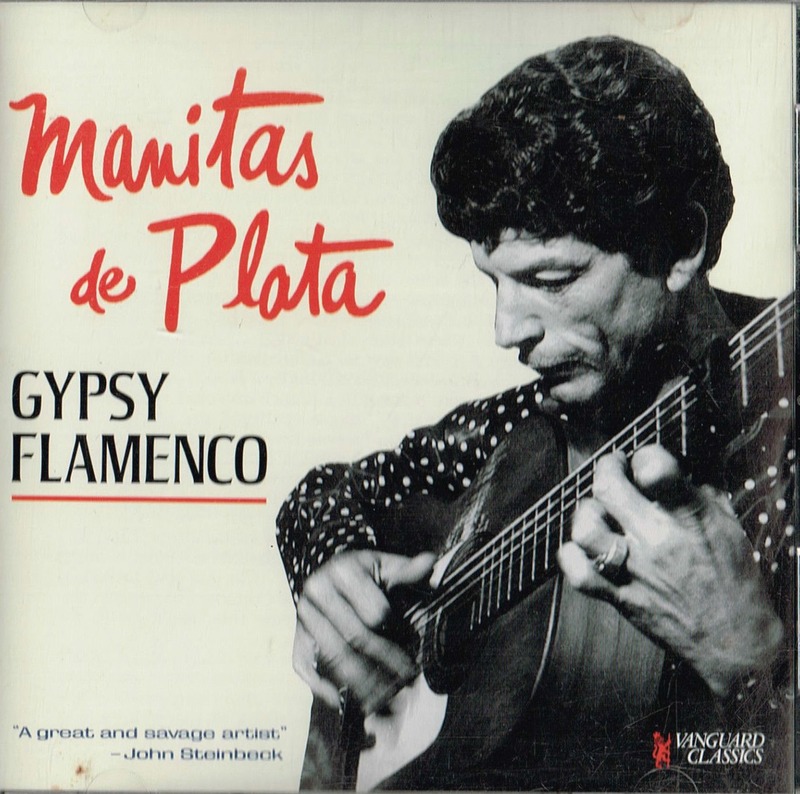 Born a Gypsy in a trailer on August 7, 1921 in the city of southern France Sète, Ricardo Baliardo aka Manitas de Plata would seem to have all the necessary credentials, except maybe being born on the right side of the French-Spanish border. One may wonder if flamenco really is, or has, a set of closed and straight-jacketing rules established in some Tables of the Law. Rather, it is a living and open tradition, enriched by each successive generation and each individual artist. 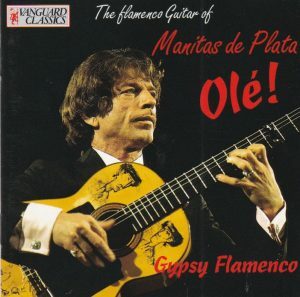 What I’ve heard of later-day Paco de Lucia, a recognized grand master of flamenco playing, seemed to me to go into flamenco-jazz-rock fusion way beyond anything heard here. 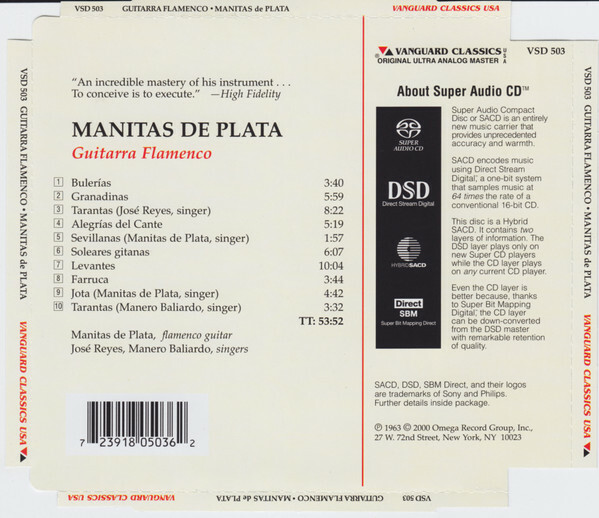 But whatever Manitas’ version of flamenco is or is not, it is still fabulous music and music-making – and although the focus is on the guitarist, don’t neglect the (flamenco?) 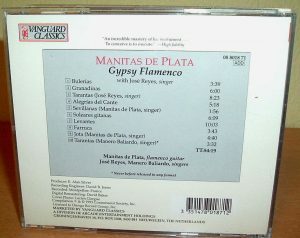 singers, Manitas himself (tracks 5 and 9), his cousin the great José Reyes (track 3) and his son Manero Baliardo (track 10). 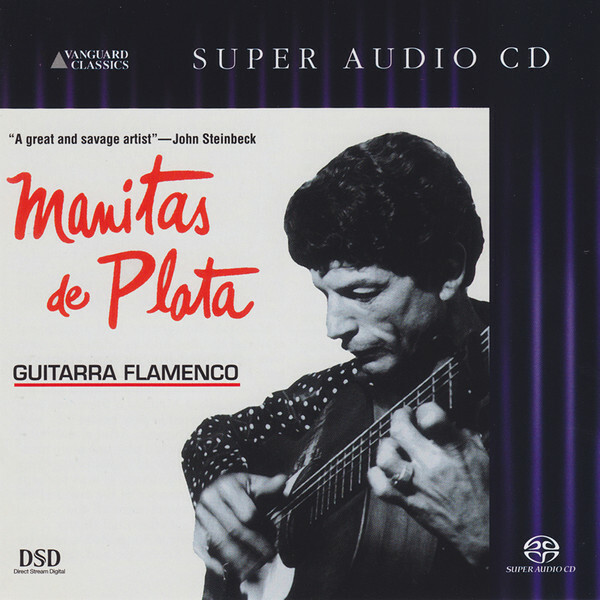 Flamenco, so far as I can tell, is an art of raucous singing as much as of wild guitar playing, and this may not be genuine flamenco, but it sure is raucous and wild. 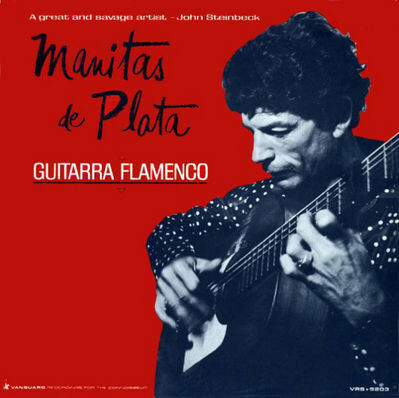 This record was originally released, in December 1965 , on LP Vanguard VSD 79203 (in the US – mono VRS 9203), under the title “Guitarra Flamenco” (see entry on discogs.com). European release was on Philips 849.477 BY and a totally different cover . 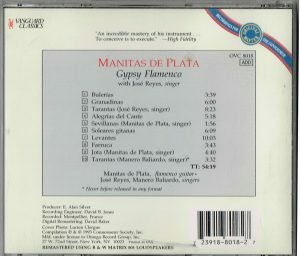 The same title was reverted to for the 2000 SACD reissue (see heading above). 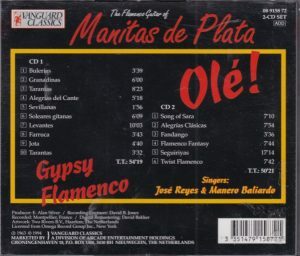 I don’t have the 1993 American CD reissue on OVC 8018, nor its European counterpart on 08 8018 71, but the European Vanguard twofer released in 1994, 08 9158 72, that conveniently pairs this program and its companion Olé! (original LP VSD-79224, CD OVC 8068, no individual release on Vanguard Europe). Where I’ve had the opportunity to check, European Vanguard (marketed by the Dutch “Arcade” company – the story of the Vanguard label in the CD era is a complicated one, which I hope to find the time survey some day in a complete discography) used the same transfers as the US Vanguards (distributed by Vanguard’s founder Seymour Solomon through his company Omega Records), and they always sound great (despite, here, one or two bizarre changes of stereo perspective, where the balance moves from one channel to the next), present, natural, and with very limited tape hiss. The liner notes of my European twofer deserve mention. 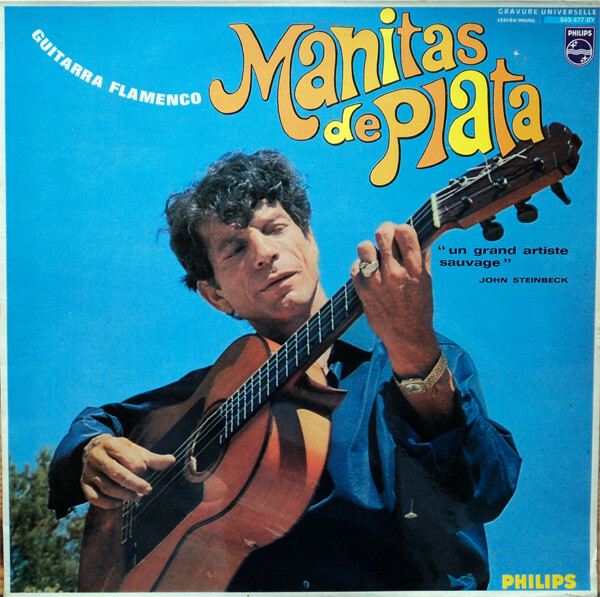 They are reproduced from the two original LPs (I was able to look at online photos of the back covers) and “Guitarra Flamenco” offered the recollections by the producer of these recordings, E. Alan Silver. They are slightly at odds with the accounts that one can find on public websites, especially Manitas de Plata’s entries on Wikipedia. Since they come here from the source, I am inclined to believe them. A few unfortunate cuts in the CD notes alter the intent and meaning of the writer, so I have reinstated the original wording (with a few small cuts of my own that don’t alter anything). Back to those two Vanguard CDs: one can’t recommend one over the other, both collate the same sessions and the same inspiration. Outstanding liner notes on my European issue, with, in addition to Silver’s recollections, a general survey of Flamenco (taken from the original Vanguard release of Olé! 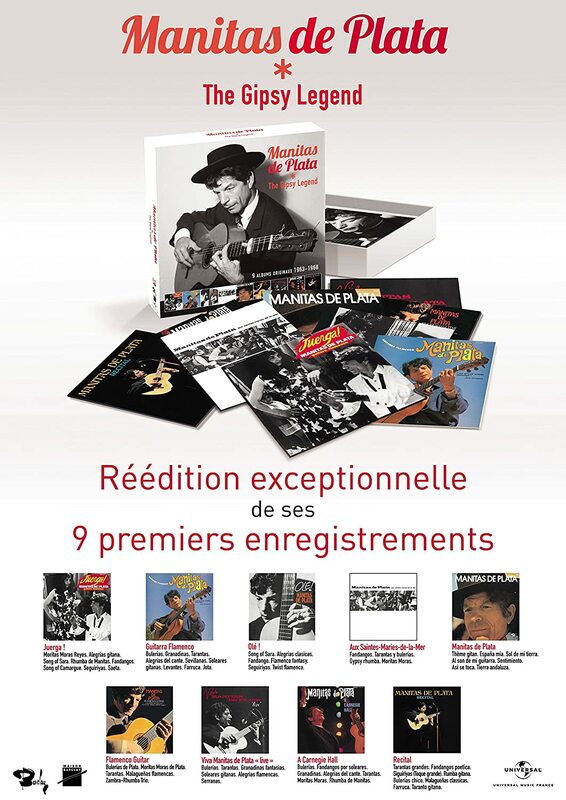 ), its roots and development, and short presentations of each piece (including of the Tarantas not included on the original LPs), with artists’ bios. TT of this one 54:19. 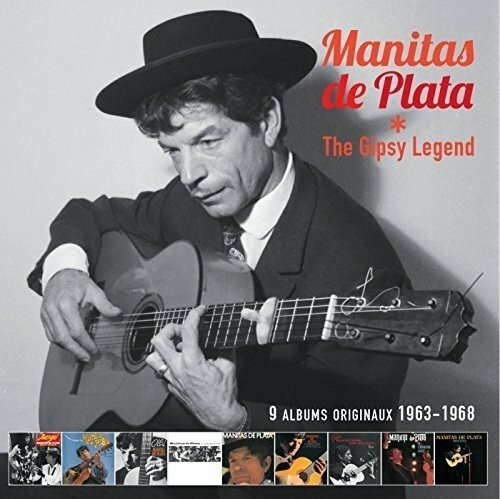 By the way, Manitas de Plata is still alive, going on 93, having survived both his cousin and his son, and he’s recently published a call for help in the French press, having recently suffered a heart-attack and claiming to be ill and broke, having earned much in his life and given even more in typical Gypsy fashion, and claiming not to know what he’s done with all those paintings that Picasso and Dali gave him, if he lost them or if they were stolen, because he “never considered Art as a commercial value”. It’s always startling to meet the real life behind the legends. France has Brigitte Bardot, once the contender with Marylin Monroe for the title of sexiest woman in the world, now going on 80 and coming out of her self-imposed seclusion only to rant in defence of animals and against the purported invasion of France by muslim aliens. Imagine Marylin today, she’d be going on 86. And James Dean at 83? Icons are better off dying at a young age, that’s what makes them icons. I’ll help Manitas, in gratitude for this great recital.